Its hard to keep track of the hundreds of festivals rolling through festival season this year, but we’re here to guide and help you keep on top of the biggest festivals around the world. S2O Songkran Music Festival held in Bangkok, Thailand is one of Asia’s original and largest for the continent. The Thai New Year (Songkran) music event will be returning for a fifth year on April 13-15, 2019. After the release of the stunning line up for the 2019 edition, the three-day festival will also get to show off its enormous LCD screens, pyrotechnics, and state of the art sound system in addition to the top notch talent roster. 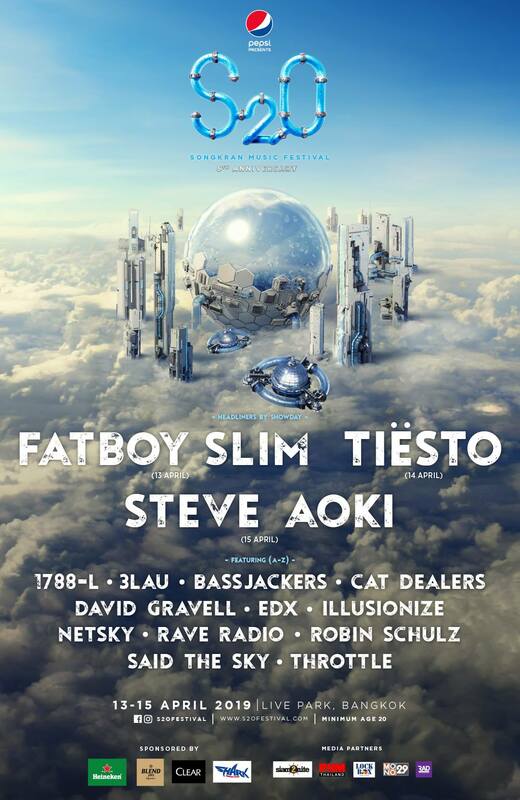 Headlined by Fatboy Slim on Saturday, Tiesto on Sunday, and Steve Aoki on Monday the unparalleled music festival will undoubtedly be the most unforgettable edition yet. In addition to the headlining talent, festival goers can catche performances from 1788-L, 3lau, Bassjackers, Cat Dealers, David Gravell, EDX, Illusionize, Netsky, Rave Radio, Robin Schulz, Said the Sky, Throttle and many more. With an unbelievable main stage set up, you’ll want to catch one of the most visually and sonically unique stages spanning any music festival in Asia. This year, the massive festival attracting over 50,000 attendees perfectly coincides with Songkran, the Thai New Year’s Water Festival April 13 – April 15. Attendees can expect to be doused with water cannons and join in mesmerizing water dances. When coupled with the lights and pyrotechnics that mid-April weekend will make for the most unique and exquisite festival experience around. Attracting crowds from all over, the successful S2O brand has also recently expanded in to Japan for the first time in 2018. Setting sights on an even bigger and more international audience, the fifth anniversary festival in Thailand will be one to catch. April is approaching at a rapid rate. S20 will be hot, wet, and wild! Grab your water guns and enter the water splashing madness of the annual S2O Music Festival. Held at Live Park on Rama 9 Road in Bangkok, Thailand, the sounds of Asia’s largest and most exclusive festival with fill the warm nights with blasts of cool water and pulsating beats from the world’s top acts and one of Asia’s most awesome and biggest productions. Grab tickets here before it’s too late!